Home Latest News Slider World News fastjet announces its financial results for the year ended 31 December 2014.
fastjet announces its financial results for the year ended 31 December 2014. Low-cost African airline Fastjet has announced its financial results for the year ended 31 December 2014, posting an increased operating losses of $72 million as compared to $55.2 million in 2013. The loss came despite a 106% rise in full year revenues to US$53.8 million ( 2013 US$26m) with a 64% rise in passenger numbers in its Tanzanian operations. Here below is a summary of fastjet’s results for the year to 31 December 2014. · Additional ancillary revenue streams introduced (including seat selection, 'Smartclass', and 'Freighty'). · Zambia Air Service Permit granted - this is a significant step on the path to gaining an Air Operator Certificate and launching flights within and from Zambia. First aircraft expected to be deployed in Q3 2015. · Loss-making services of Fly 540 businesses in Ghana and Angola remain suspended, now treated as discontinued - minimal cash cost in the year. · Disposal of investment in Fly540 Kenya - legal and financial indemnity received. · Zimbabwe Air Service Permit granted marking a significant step on the path to gaining an Air Operator Certificate and launching flights within and from Zimbabwe. First aircraft targeted to be deployed in Q3 2015. · Fourth aircraft lease - a letter of intent (LOI) signed for the lease of an Airbus A319 as part of planned fleet expansion. · 50% reduction in year on year EBITDA loss margin. · Loss including discontinued businesses US$72 million - loss from Fly 540 Angola and Ghana US$27.7 with less than US$0.25 million of fastjet Plc cash used in these legacy operations. · £50 million equity fund raise, significantly broadening the institutional shareholder base. · Share capital reorganisation - consolidation of ordinary shares on the basis of one new share of £1 each for every 100 shares of 1p each. · Restatement of 2013 financial statements in relation to the 2012 purchase of the Lonrho aviation business. The transaction was treated as an acquisition by Rubicon (now fastjet Plc) whereas it is more correctly treated as a reverse acquisition by Lonrho, as whilst the Lonrho board in practice did not, it could have sought control of the Company. The restatement has neither any cash effect on any of the years concerned nor any material impact on the 2014 trading results. · Significant growth in fastjet year-on-year passenger numbers expected to continue, with the level of passenger numbers achieved reinforcing fastjet's stronghold in the Tanzanian market, and the attractiveness of both the low-cost fare structure and operational reputation. · Growth for 2015 expected to come both from the Tanzanian operation and from the addition of new fastjet airlines in Zambia and Zimbabwe. · Current fleet is now nearly fully utilised - extra capacity is required with a fourth aircraft due to join the fleet in Q3. The aircraft in question will be the first of a number of aircraft that fastjet is planning to add to the fleet this year, with each additional aircraft able to make up to 1,000 more seats per day available to customers. Based upon the 75% load factors currently projected, each aircraft in the fleet is expected to carry approximately 275,000 passengers per annum. · Negotiations on further aircraft underway with target to build a fleet of up to 34 aircraft operating to 40 destinations within and from Tanzania, Zambia, Zimbabwe, South Africa, Kenya and Uganda by the end of 2018. 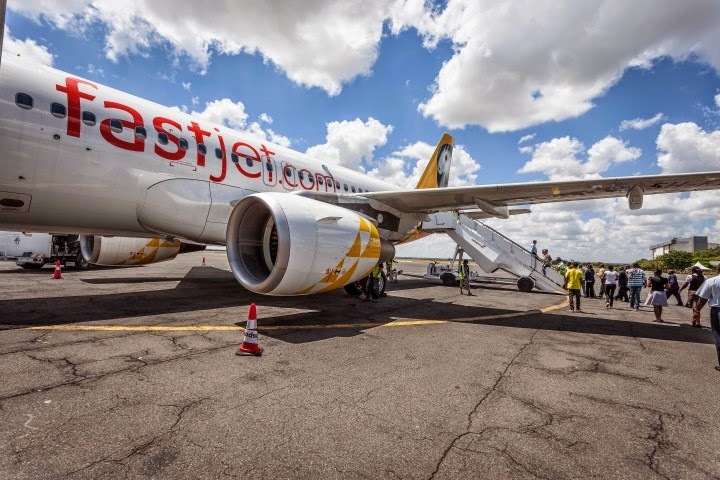 Ed Winter, fastjet Chief Executive Officer, said: "2014 has seen a significant increase in the number of passengers travelling on our core Tanzanian routes, with revenue more than doubling. Aircraft utilisation grew sharply and average revenue per passenger also climbed with our services such as seat selection proving increasingly popular with customers. "Strong underlying traffic growth during the year continues to demonstrate that fastjet's low-cost airline model works in the African market. This growth in traffic underpins our belief that people across Africa are increasingly embracing the travel opportunities offered by fastjet's safe, reliable, and great value product, with a high percentage of first time fliers. "fastjet continues on its path of expansion, with new routes in Zimbabwe and Zambia planned in 2015. I look forward to this coming year with great confidence as fastjet leverages its first mover advantage to the benefit of our customers and shareholders." On 20 April 2015, the future of our Company was transformed by the completion of a £50 million equity funding. We now enjoy the enviable position of being properly funded to progress our aim of becoming the most successful pan-African low cost airline. The need for a pan-African low cost airline is unquestionable. Africa's size, challenging terrain and poor infrastructure make air travel the logical choice over the arduous road alternative. It is our belief that the air service offered by the traditional carriers is severely restricting the development of economies across the continent. Cross border trade, tourism and social benefits are impacted by fares that are artificially high due to a lack of competition, out-dated practices or poor operational policies. Economic growth and increasing political stability in many African countries is creating positive change. There is a rapidly developing middle class that has an appetite for consumerism and travel. There has never been a greater opportunity to establish a safe, reliable and affordable air travel option for both business and leisure, and in Tanzania we have proved the model works and are set to replicate this across the region. Challenges do exist however. Certain governments are reluctant to open their markets to increased competition and whilst there are pan-African agreements relating to the de-regulation of African skies, a few authorities still protect their markets in a bid to insulate flag carriers from modern and nimble challengers. Happily other governments embrace the opportunities for the benefits of their population. From time to time there will be issues in some of the territories in which we seek to operate. This is the nature of operating in emerging markets. However, provided we deliver according to our plans over the next few years, the value of our Company should increase strongly to reflect that success. We currently operate three aircraft from our Tanzania base. Our plan is to grow to a fleet of thirty-four aircraft by 2018 operating from bases across the region. In Ed Winter and the executive management team we have the people in place to turn the opportunity into reality. They in turn now have the funding to progress it. I would like to take this opportunity to thank our staff without whose skill and dedication we would not be in our current strong position. We look forward in the coming months and years to not only delivering a strong financial return to our investors but also to play our part in democratising air travel in Africa. A full, in-depth report including strategic reports and full financials can be accessed here: Results for the year ended 31 December 2014.